Thursday 5 Flav, our driver & guide, drove us out of Brazil and into Argentina for a tour of the falls from the other side. I only had one clear double page in my passport (which I was expecting to need for an Indian visa later in the year) so had to asked Flav to request that the border guards place the multitude of stamps elsewhere. Once inside the park we used the 'Ecological Train' to reach the trail heads. Our first stop was at the Devil's Throat. 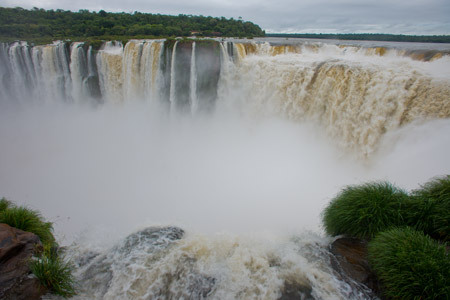 It was good to see the falls from the Argentinian side. 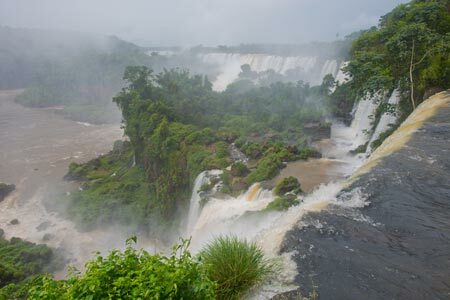 We could get much closer to the falls than on the Brazilian side but this did of course make it much harder to get good photos. Once we had been thoroughly drenched at the Devil's Throat we walked along the upper circuit. Finally we completed the lower circuit. We headed back into Brazil and back to our hotel.